A contemporary take on the traditional Taiwanese courtyard. Weijenberg is collaborating with a prominent Taiwanese chef, looking to reinterpret traditional local culture in a contemporary way, through food as well as a spatial experience, at this new restaurant building in Taichung, Taiwan. A parking lot in central Taichung is due to be transformed into a pop-up scene for local foodies. 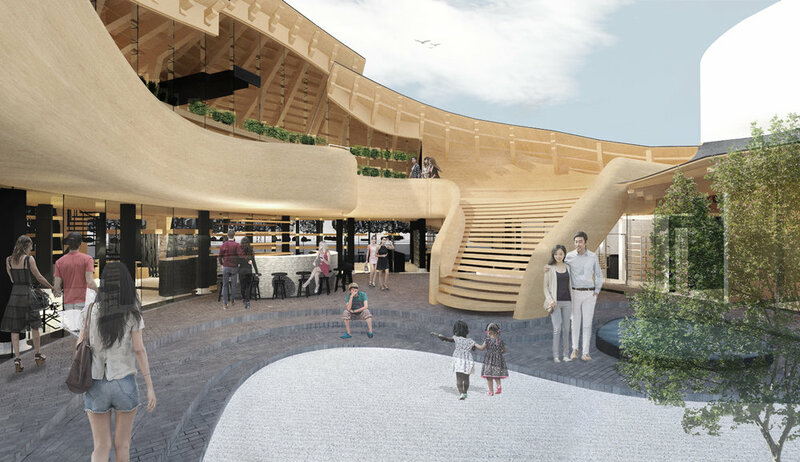 This temporary food market of shipping containers, called 'UNO Market’, is currently under construction, and Weijenberg’s new project is planned as the star pavilion within the development, offering a daring and contemporary design proposal. The Weijenberg team will always look to the local and traditional for inspiration. Here it came from traditional Taiwanese architecture. The grammar of the vernacular dwellings was taken as a starting point for the design, by studying traditional roof structures, with particular attention to the forms, layers and details. The theme of light and shade was carried into the architecture through the traditional Taiwanese courtyard. The translation of a traditional Taiwanese roof is articulated in the wave-like roof shape around the courtyard. All functions from the restaurant, kitchen, working spaces, gallery, to the shop are collected under one undulating roof. As sustainability is a very important to the client and the firm, we have applied wood as a primary building material. The roof structure is made entirely of glulam beams and rafters. Wood has been heavily used as a building material in Taiwan for centuries. Our desire is to bring sustainability into the project focus and re-introduce wood as a primary building material choice to inspire locals. The construction process is due to commence after Chinese New Year 2018.